← TIM WOODRUFF. Health Reform From Labor: Does the Policy Match the Vision? The banking and finance commission’s focus was on specific poor behaviours. It avoided broad policy issues, including the general failure of competition to improve consumer outcomes. Just two days after the Government released Justice Hayne’s report on the finance sector, the Commonwealth Bank reported a six per cent fall in profit for the half year to December 2018 (to an immodest $4.6 billion), and an unchanged interim dividend. A profit fall was hardly surprising in light of toughening conditions in the housing market and an increasing cost of funds on the open market. In its scripted Q&A-style video announcement, CEO Matt Comyn assured all that the setback was minor, and that the bank was on its way to improved financial performance. It has become an axiom that profit, particularly when it keeps on growing, is an indicator of a business’s success, but it’s an axiom that should be questioned, because a sustained profit in an industry such as finance suggests that all is not well. To illustrate, we can think of the natural monopolies such as electricity and water supply, which are private companies or corporatized government entities providing basic services. The main task of government-appointed regulators is to make sure that such firms make no more than what economists call a “normal” profit. That is, a reasonable return on funds employed – a return that’s commensurate with other industries with similar risk profile. Just what constitutes a “normal” profit is a matter of contention, but the principle that such firms, providing basic and necessary services, should not be ripping off customers through supernormal profits, is well-established. As with electricity and water supply, the services of the finance sector are essential basic services, but evidence of sustained profits in the finance sector was not a concern or even a consideration in the Commission’s work. (It confined its consideration of profits to the specific case of so-called “financial advisers”.) But the evidence of the sector’s profitability is in plain sight in our national accounts, presented in the graph below. 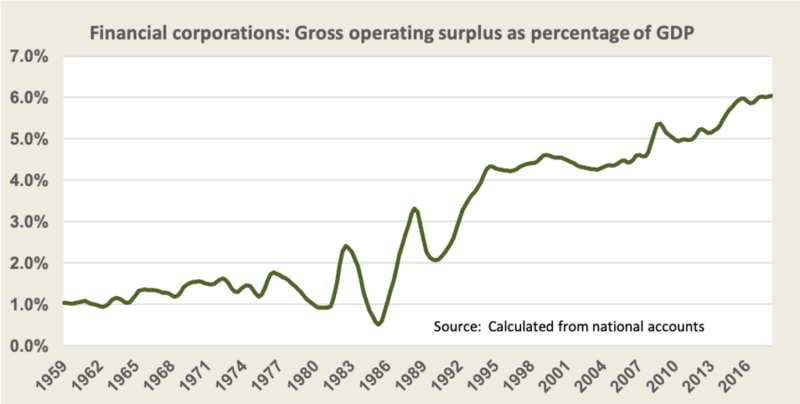 (“Gross operating surplus” is economospeak for what is commonly known as “profit”.) After being knocked around by the recessionary shocks of the 1980s and 1990s, the sector took off with vigour, spurred by Keating’s partial de-regulation of the sector and the hype of “financial dynamism”. It is reasonably well-known that over the last fifty years there has been a large shift in the wage vs profit share of GDP. What is less well-known is that almost all of this shift is accounted for by profits in the financial sector. The profit share of non-financial corporations – the economy where there is real value-added – has shown no sustained growth. A critic’s response to this revelation would be to point out that while electricity and water are natural monopolies, the finance sector is open to competition, and we have plenty of players in the market. But that begs the question why competition has not pegged back the sector’s profits to “normal” levels. A critic’s fallback explanation would be that the sector has grown and therefore its profits have grown. The sector has indeed grown – as a share of GDP it has doubled – but that doesn’t explain why its profitability has risen sixfold. Another response would be to point out that profits above “normal” levels are a basic feature of dynamic capitalism. When a firm introduces a product or process innovation it gains a competitive edge, which it sustains until its rivals catch up, and the tough processes of competition bring profits back to “normal” levels. There have indeed been innovations in transaction banking as anyone who remembers the days before credit cards, ATMs and internet banking. But it’s almost half a century since the Bankcard was introduced in 1974, and electronic banking through home computers dates back to the 1980s when the Viatel service was introduced. The economic model underpinning the idea that competition will always work to customers’ benefit, however, rests on the idea that above-normal profits in a firm or industry will be transitory and will not endure in the long run. But when an industry exhibits sustained and growing profits over an extended period, when a minor reversal such as occurred with the CBA is seen as problematic, there is clear evidence of market failure. A thirty-year run isn‘t “transitory”. This market failure in finance is a specific manifestation of a fundamental flaw in our (largely bipartisan) policies on consumer protection. Our regulators are obsessed with market structures – the number of firms in an industry, the absence of collusion, the ease of access for new firms – in the belief that a competitive structure is all that’s necessary to bring about consumer benefits of lower prices and better services. Bodies such as the ACCC tend to ignore problems such as search costs and transaction costs, but anyone who has tried to switch banks would know the naivety of advice to “just shop around”. In addition there is a belief that the easiest way to protect against a bank rush or a financial meltdown is to ensure that banks stay highly profitable. It’s a lazy way to achieve a degree of prudential protection. This was the Coalition’s excuse for being so reluctant to call a commission in the first place. But before we self-righteously bay for the finance executives to be loaded into a tumbril (business class seats for the CEOs, premium economy for the financial planners) and paraded down Martin Place, we should remember that, through superannuation and other investments, many Australians have a stake in bank profits. Also, the finance sector, being largely Australian-owned and domiciled, is one of the better corporate taxpayers. It’s an easy source of public revenue, which saves the ATO from making too much effort to tax foreign corporations or high net wealth individuals. Another form of lazy policy. So we have the weird situation that, as Hayne’s commission demonstrates, while depositors and borrowers are badly exploited by the finance sector, some of the revenue comes back to us in terms of dividends, superannuation payments and public revenue. That is, after it has been creamed off by overpaid executives, financial planners, and hangers-on such as mortgage brokers and real-estate agents. It’s an extraordinarily costly and inequitable way to achieve public policy objectives of financial stabilisation, funding of retirement incomes, collection of public revenue and provision of essential financial services. And it’s all laden with perverse incentives and high bureaucratic overheads. Hayne’s terms of reference we now learn were prepared in consultation with the finance sector. They precluded the commission from considering such basic but important policy issues. Perhaps a commission with broader terms of reference would have noted that, until its privatisation in 1991, the Commonwealth Bank, in providing what is known as benchmark competition – more colloquially as “keeping the bastards honest” – achieved what a permissive attitude to the finance sector has failed to achieve. In that era a profit of $4.6 billion, or indeed any profit higher than a “normal” return on funds employed, would have been considered a failure by management. It’s certainly a failure of public policy.